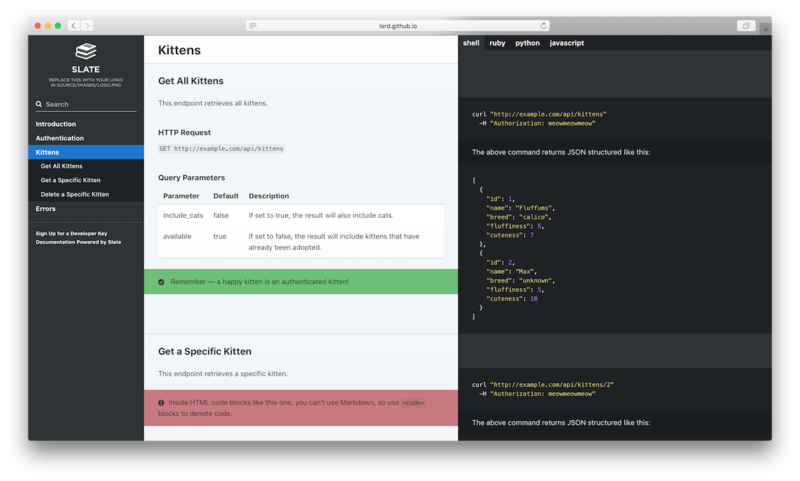 Clean, intuitive design — With Slate, the description of your API is on the left side of your documentation, and all the code examples are on the right side. Inspired by Stripe’s and PayPal’s API docs. Slate is responsive, so it looks great on tablets, phones, and even in print. RTL Support Full right-to-left layout for RTL languages such as Arabic, Persian (Farsi), Hebrew etc. Questions? Need Help? Found a bug? If you've got questions about setup, deploying, special feature implementation in your fork, or just want to chat with the developer, please feel free to start a thread in our Spectrum community! Found a bug with upstream Slate? Go ahead and submit an issue. And, of course, feel free to submit pull requests with bug fixes or changes to the dev branch.